“I came to Mama’s Comfort Camp in the midst of postpartum depression. I was anxious, overwhelmed, isolated, and the support I found here literally pulled me through my darkest days." “I have grown from hiding my need for help to actually asking for it. I no longer judge myself when I see other moms and how they parent. Now I give myself grace and love over things I use to feel huge guilt over. Because of MCC I’m taking more time for self care and have a stronger voice to advocate for my family’s needs." “Mama's Comfort Camp is a university of compassion"
Mama’s Comfort Camp (MCC) is a peer to peer support network that improves maternal mental health by normalizing the hard parts of motherhood, facilitating the asking and the receiving of help, and fostering a communications culture of kindness. We meet mothers where they already are: on their phones and screens. No one has to leave the house or find childcare in order to get the help. We serve mothers in the painful scarcity of mental health services: even those who have the financial ability, health insurance, and the courage to seek help rarely see their providers more than once a week. MCC provides constant access to emotional support regardless of time, place, financial ability, transportation, and childcare. This is truly revolutionary and unique. For those who don’t have access to mental health services, MCC is the closest thing they have to mental health support — always available, and absolutely free. We can't expect flowers to turn into fruits if we don't water the roots! We live in a society that touts the needs of children while ignoring the needs of the parents. It's time to put support where it makes the most difference: where the mothers are supported, the entire community thrives. Your donations enable us to keep our emotional support forums FREE for ALL MOTHERS. 1. Improve moderation systems: our volunteer moderation team was able to sufficiently support hundreds of members, but now that our groups have grown to thousands of members, more consistent scheduling and better training materials are necessary in order to hold the safe space effectively for our fast growing membership and to create an environment that is truly welcoming for people of all backgrounds, cultures, and abilities. 2. Provide administrative support that will help the many moving parts of MCC work effectively together online and within real life communities. 3. Create educational materials that advocate for the needs of mothers and families and amplify the voices of parents in order to influence policy and the allocation of resources. MCC serves all mothers, from mothers-to-be to grandmothers and every age and stage in between. We're not a parenting forum: it's not about learning how to be better mothers to our children, it's about being HAPPIER and HEALTHIER ourselves. MCC provides a safe space for mothers to be seen and heard, and to feel less alone and less scared - normalizing the struggles of motherhood through peer support and honest conversations available 24/7. This is a surprisingly effective (as well as cost-effective) mechanism for crisis and suicide prevention, reducing isolation, disarming guilt, shame and blame, alleviating depression and anxiety, and facilitating deep and lasting friendships. We provide protection from unsolicited advice because when a mother is struggling emotionally, often well meaning advice triggers more guilt and shame in ways that are crushing. Maternal suicide is highly correlated to the presence of acute guilt and shame. Disarming these emotions in a safe space saves lives. We are seeking funds to upgrade our vibrant, volunteer-run, peer-to-peer mother's network, moving from the uneven terrain of relying solely on the work of volunteers to the more stable footing possible only when financial support is provided for the cause. A world in which mothers are deeply supported emotionally, physically, and economically, and a community in which all are seen, heard, and held. To normalize the struggles of motherhood, facilitate the asking (and the receiving) of help, amplify the influence of parents on policy making and allocation of resources, and improve well-being by fostering self-care and a culture of kindness. MCC was founded in 2012, and has been serving mothers for over 5 years. An international online emotional support forum: where thousands of mothers from around the world support each other (peer support, not medical advice). The Ithaca Chapter of MCC: an online forum for local and practical help, building bridges within and across the community and facilitating the sharing of resources in the birthplace of MCC with over 2,200 participating moms. the local chapter offers peer support meetings, mom’s nights out, family celebrations, swaps and exchanges, workshops and classes. Information channels that educate Ithaca area parents about events and services they find useful and inform organizations of the desires of parents. Parent activism events that include childcare, seeking to influence policy and allocation of resources to better meet the needs of parents and children. Intentions for Future forums: mothers in other locations expressed interest in creating local chapters as well as forums that use languages other than English. 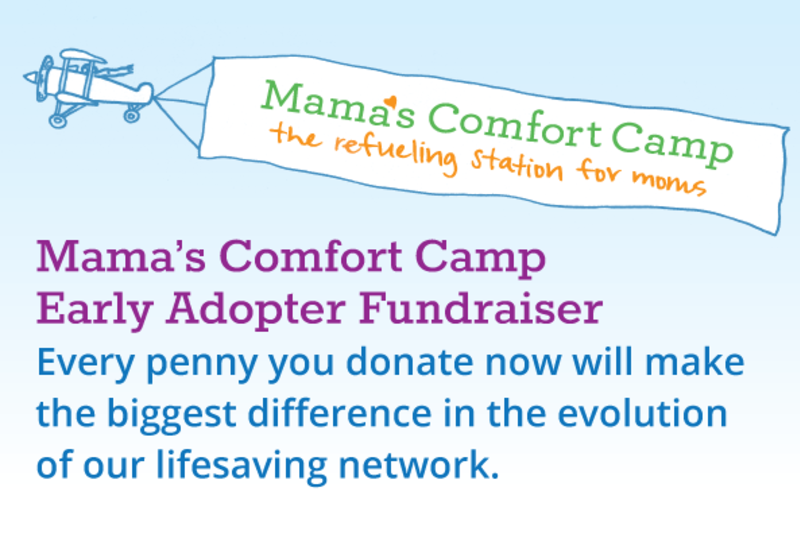 Mama’s Comfort Camp is a nonprofit project of the Center for Transformative Action, a nonprofit incubator at Cornell University. Donors participating in this GiveGab campaign will receive a receipt for their tax deductible donation via email. Prefer donating with a check rather than a credit card? No problem, here's how: Mail your check to the Center for Transformative Action, 119 Anabel Taylor Hall, Ithaca, NY 14853. Please mention Mama's Comfort Camp on the memo line of the check. Donations made by check will not be visible on this campaign page, but will go directly to our account at CTA. Donors paying by check will receive a tax deducible donation receipt by US Mail. Whether you make a donation today or not, thank you for reading. Thank you for caring about the well being of mothers. Please help out by sharing this page on your social media channels. Mama's Comfort Camp exists to normalize motherhood struggles and inspire self-kindness throughout motherhood journey: we serve all moms from new moms and grandmothers and moms in every stage in between. Mama's Comfort Camp is not a parenting forum. We don't come here to learn how to be better moms to our children, we come to be happier mamas. We do that by having a safe space to be seen, heard; we help each other feel less alone, less scared, less scarred. The support we get here has the beneficial side effect of allowing us to be stronger, which means we are better able to parent, but moms deserve support because the well being of mothers is reason enough. Mama's Comfort Camp is a nonprofit project of the Center for Transformative Action, a 501-c3 organization affiliated with Cornell University.